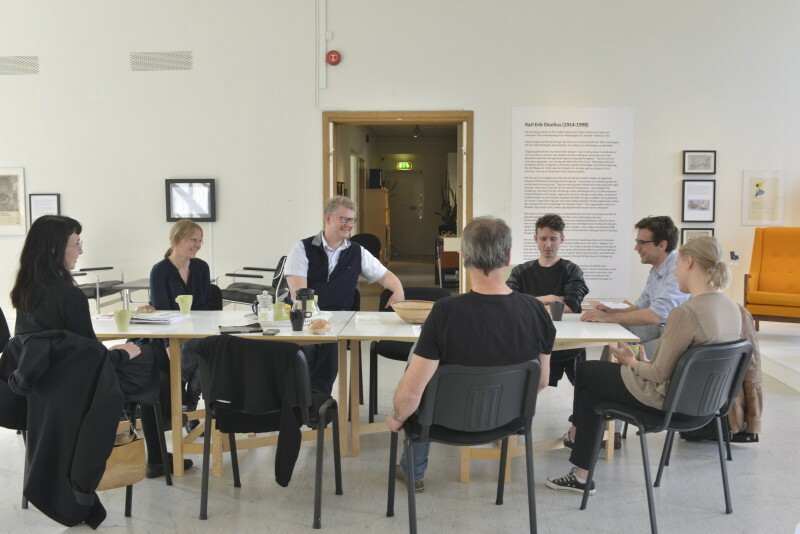 During the spring of 2015 Side-Show invited Poste Restante to make a new work especially for Vetlanda, based on their visits and meetings in the municipality during 2015 and 2016. The work, with the title The Electees was performed inside the municipality’s council assembly room in Vetlanda Town Hall in October 2016. To coincide with the performance the installation Vertigo of Empowerment was exhibited at Vetlanda Museum. The Electees was a sound work in which the visitors were offered the possibility to experience the paradoxes that arise when representative democracy is put into practice. 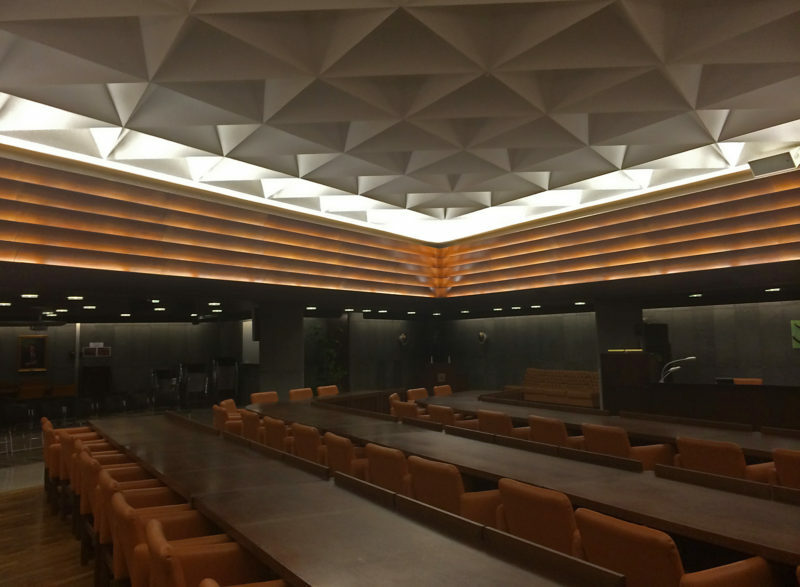 By clear instructions from an earpiece, they were lead into the Council Assembly hall and through an emotionally charged meeting in which decisions had to be made – decisions that would have consequences for people other than yourself. Together with the other electees the audience would re-enact the choreography and ritual of the meeting in a soundscape of a live choir and opera as well as music composed especially for the work. The Electees was a performance about the friction that may occur when the task to represent the ones who have elected you because of your conviction has to fit into the tight choreography of democracy. Moving through the score of a meeting – at times in harmony, at times in dissonance – the visitor was invited to experience the conflicts inherent in the realms of democracy with the conviction of its necessity at stake. Scroll down for information in Arabic. Eight performances were given during two weekends in October 2016. The performance was given is in Swedish, English and Arabic. Distribution: Key PerformanceThanks to EMS (Elektron Musik Studion), SFI Vetlanda and FARO. THE ELECTEES was produced by Side-Show in cooperation with Vetlanda Museum, with support from the Swedish Arts Council, Region Jönköping County and Vetlanda Municipality. سيبدأ العرض الاول للنشاط الرابع عشر من شهر أكتوبر ٢٠١٦/١٠/١٤ في مجلس بلديه فيتلاندا. و سوف يتضمن عرضين من الأداء في كل ليله من الساعه السادسة مساءآ وحتى الساعه الثامنة مساءآ كل عرض سوف يستغرق ٦٠ دقيقه و التجمع سوف يكون في مكتب الإستعلامات الواقع في مجلس البلديه( الكومون) . الثلاثاء : من الساعه العاشره وحتى الساعه الرابعه عصرا. من الاربعاء و لغايه يوم الأحد : من الساعه الثانية عشر ظهرا وحتى الساعه الرابعه عصرا. خلال العرض سوف تحصل على ارشادات تعليميه من خلال سماعات مكبرة للصوت لذلك يرجى الهدوء و الانتباه و التركيز في القاعه و عدم اصطحاب الأطفال الصغار في العمر. Poste Restante is a Stockholm-based performance group founded in 2007 by Linn Hilda Lamberg, Stefan Åkesson and Erik Berg. Poste Restante makes site-specific performance works where the visitors are invited to participate. Their works operate in the boundaries between theatre and visual arts, and are usually experienced outside of the traditional spaces for these two art forms. As a visitor to their work, you become its lead character, its focus as well as its recipient. Every visitor is met with respect for his or her particular preconditions. Poste Restante take their visitors to unexpected places, such as abandoned offices, 24-hour churches, anonymous alleyways and inaccessible embassy villas. The sites are often hyper-realistic, functional and made completely available for the visitors’ use. The sites often have strongly recognizable atmospheres; sometimes a sense of eeriness and other times a distinct sense of nostalgia. We are brought back to memories of the Swedish Welfare State, to public housing kitchen cabinets and the gymnasiums and recreation rooms of our childhood. The works often reflect on intractable personal dilemmas, internal conflicts and shameful desires. There are no simple answers or final solutions. The works set out to give visitors the opportunity to think complex thoughts through to their end and the courage to take his or her own feelings seriously. Poste Restante have previously made works that address the desire for a belief in God, the right to self-absorbed melancholy and the longing for a sense of community. The works are presented in the form of staged “activity centres”, such as a training facility for those who find it difficult to “have fun”, a helpline for the politically depressed or the premises of a secret society. Poste Restante has previously worked with venues and organizations such as the Modern Dance Theatre, Stockholm, Backa Theatre, Göteborg and Mobile Art Production, Stockholm. Their works have been shown in cities such as Umeå, Santiago, Warsaw, Salzburg and Antwerp. Vetlanda Museum was Side-Show’s partner in Vetlanda. Museum Director Thomas Johansson, together with the museum staff, contributed important knowledge and provided contacts within the local communities. The Museum served both as an ambassador and a resource centre for the project. Vetlanda Museum is a municipal art and cultural history museum with the mission to document, preserve and inform about Vetlandas’ natural and cultural heritage. The Museum does this through participating in culture and development projects and by providing support and services to local associations, local history societies, companies and individuals. Read more about Vetlanda Museum here. 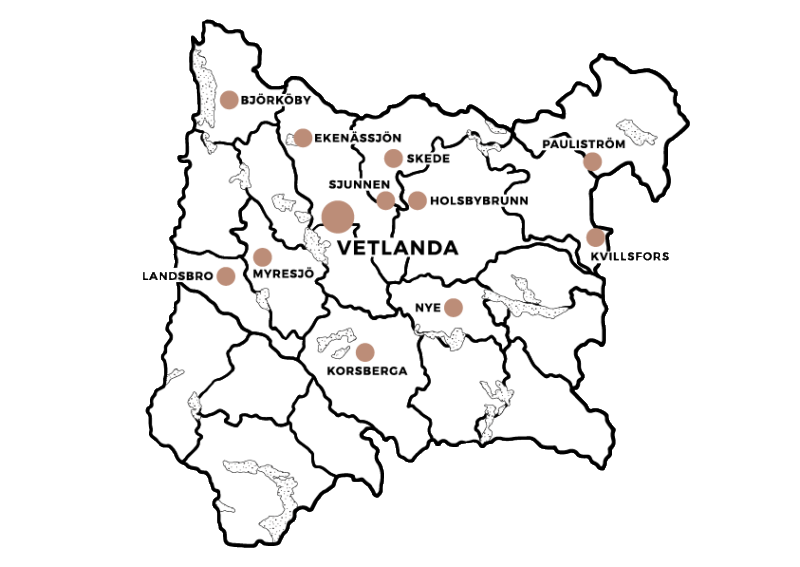 Around 13000 people live in the town of Vetlanda, and in the municipality the population is 26,647. Over the past 10 years, the population rates have not changed significantly, but in 2014 the number of residents increased with 239 people. Vetlanda municipality can be characterized by its many associations (over 200), and by its strong interest in sports, which is made visible through its many sports halls and two new sport stadiums.Vetlanda is known for its speedway club and their bandy team, Vetlanda BK, but tennis and horse riding are also popular within the municipality. In Vetlanda municipality 30% are working within the manufacturing industries. Vetlanda is an old “woodwork town” but today it is not dominated by the wood industries anymore. The aluminum company Sapa is a large empolyer as well as Elitfönster, one of Sweden’s largest window manufacturer. The municipality itself has approximately 2500 employees. Vetlanda has long been led by a center-Social Democratic municipal council, but not since the most recent election; see more about Vetlanda political colors here.